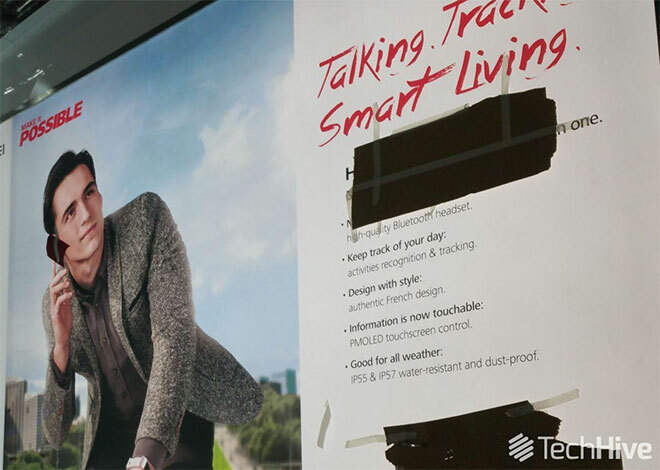 Both have been spotted at the MWC 2015 showroom floors in large banners, but the actual product photos have been hidden with black tape. 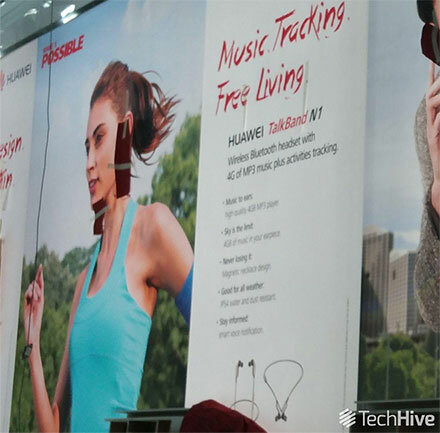 Anyway, the Huawei Talkband N1 is an MP3 player with an activity tracker and Bluetooth connectivity. It sports 4GB of on board storage and is IP54 water resistant. The Talkband N1 also supports Voice notifications. As for the Talkband B2 is a successor to the Talkband B1 revealed last year. The new generation sports all new design, which Huawei says is made by a French designer, whose name is yet unknown. The Talkband B2 tracks steps and sleeping, but still doesn’t feature heart rate sensor. It’s IP55 and IP57 dust and water-proof. Finally, it features a PMOLED touch screen, but size and resolution are yet to be announced. The company’s press conference starts in three hours, as Huawei is going to make a splash this year with its wearable devices. Headlining the pack is the Huawei Watch, which as we saw earlier today looks magnificent.